The British Army first used tanks in the First World War and they have played a vital role in every major land conflict since. Priya Kantaria takes a look at some of the most important tanks to have rolled across the battlefield. Black Night is BAE Systems’ vision for the proposed upgrade of the British Army’s Challenger 2 Main Battle Tank. Credit BAE Systems. The world’s first tank, as we know them, was invented in Britain and grew out of a prototype by Fosters of Lincoln. It was known as ‘Little Willie’ and was in production by the end of 1915. Little Willie was built from components designed by a number of industrialists, including imported American tracks and drawing on technologies developed on previous war projects. It was built on an unsuspended track frame and fitted with a non-rotatable dummy turret with machine gun mount. It was 8m-long and needed two men to drive it; one for steering, clutch, gearbox and throttle operation, and another for brakes. Another four operated the weapons. It was protected with boiler-plate armour and could only travel at two miles per hour. But Little Willie never went into combat, even though it was developed during The Great War between 1914 and 1918. Instead, it led the way for another prototype, Big Willie and later Mother, which used a rhomboid track frame that let the tracks move right around the vehicle, and the turret was replaced with armament in side sponsons. The first tank to actually engage in battle within the British armed forces was known as Mark I. This tank had two variants – a 28t male, armed with two six-pounder guns and three 8mm Hotchkiss machine guns and the 27t female variant had four 0.303 Vickers machine guns and a single Hotchkiss. Each tank carried eight soldiers. The first purpose-designed infantry tanks were the Matilda I model, armed with machine gun and Matilda II, armed with machine gun and QF 2-pounder anti-tank gun. Manufacturers built 2,987 Matilda IIs between 1940 and 1943. The Matilda tanks were followed by the Valentine and Churchill tanks, designed using an interior and chassis layout of an experimental model called A10. The Valentine was developed in 1939 and by 1944, 8,275 had been built. Although it was stable and reliable, it was hampered by its small size. The Churchill had several mechanical defects early on, but the tank had excellent weight distribution and was considered very stable in movement. British tanks grew larger and were fitted with more powerful engines, enabling them to carry larger guns and more armour, as well as move at higher speeds. At the end of World War Two, the Centurion was created, known as the ‘universal tank’. The Centurion was the primary British tank of post-World War Two. Its development began in 1943 and manufacture began in January 1945. It entered combat with the British Army in the Korean War in 1950, supporting the UN forces. With high mobility capabilities, it was able to climb hills considered difficult for infantry and had an L7 105mm gun. A total of 4,423 Centurions were built between 1946 and 1962. It went on to be one of the most widely used tank designs in armies worldwide. The L7-equipped Centurion was fitted with improved gunnery and drivetrain and equipped with superior protection and firepower, and the new prototype was known as the Chieftain. The Chieftain was one of the most heavily armoured and armed tanks of its time. The development of Chobham armour, a composite armour developed in the 1960s, led to the design of a new tank with several other improvements called Challenger. Challenger used a laser rangefinder in a highly automated fire control system. It had an improved engine and suspension that offered a better off-road performance. In 2003, the UK was a major player in the invasion of Iraq and led a force consisting of 112 Challenger 2 tanks. The Challenger 2 now forms the core of the army’s heavy tank units. It is known for its durability and endurance, due to its ceramics-based Chobham armour, which can endure extreme heat and impact. Challenger 2 is the result of more than 150 major modifications on the original Challenger model, including a completely new turret, L30 CHARM 120mm gun and second generation Chobham armour. 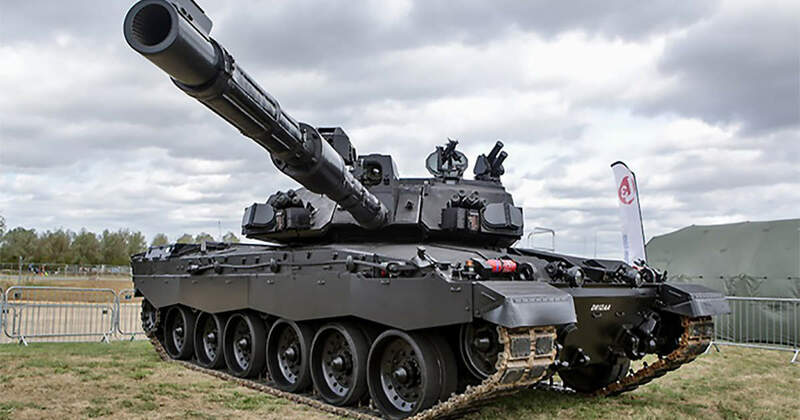 The Black Night life-extension project for Challenger 2 includes a range of the latest technologies from BAE Systems, including an active protection system that enables the tank to detect incoming anti-tank missiles or armour penetrating rounds and automatically launch a counter explosive. It has a laser warning system so that when targeted by enemy weapons, the tank can identify and automatically aim the gun towards the source. It has regenerative braking, making it more energy efficient, generating power when the gun is slowed down into position. Black Night also offers thermal imaging technology, with front and rear infrared cameras to provide night-time imagery.